On the Name . 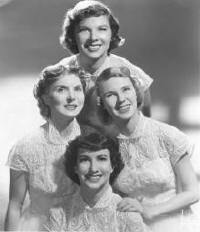 . .
Monroes' new fem vocal group which was first hired as a quartette, has now been increased to a quintette, with the addition of Mary Lee, a former member of the Lee Sisters. The four girls, who were discovered by Dixon Gayer, NY publicity agent, have had a variety of tags in the short time they have been with the band. First they were to be known as "The Moonbeams" but it was discovered that Kay Kyser used a group of that name on a recent record. They switched to "The Moon Racers," dropped that and are now known as "The Moon Maids." From Lois's Niece . . . I'm saddened to let you know that my Aunt, Lois Wilber Johnson, who was a Moonmaid until 1953, passed away December 15, 2014 in Minneapolis MN. It was 44 years to the day after her husband, Ernest Johnson, pianist and music arranger for Vaughn Monroe, passed away. After my Uncle Ernie left the orchestra, they moved to Dallas, Texas, where he started his own band, and when he passed away, Lois moved back to Minnesota with their four children to rejoin her family. On being a Moonmaid . . . 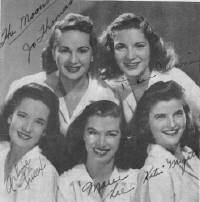 I was one of Vaughn Monroe's original Moon Maids from March 1946 to late December 1949. What a great experience! Being on the weekly Camel Caravan radio show kept us constantly reading music and learning! We met many celebrities who were guests on the radio show. There were long stints at The Meadows night club, The Commodore Hotel, Atlantic City and Asbury Park, as well as theaters across the country. And there were those one-nighters, all across America! We were on more than 50 Victor recordings with Vaughn and the band. On those one-nighters . . . Yes, those days with Vaughn Monroe were fun, (and TIRING) but exciting! We Moonmaids lugged around heavy luggage, as we lived out of a suitcase and a trunk! We had make-up kits to drag along too. We also kept our gowns in hanging bags. Much of what we used was carried in the equipment truck that went to our jobs separately from the bus we rode in. It sometimes had to be carried by us though. We traveled by bus most of the time, but occasionally by train. I can remember only a time or two that we flew to a job. We would arrive in the town we were to appear in, in the wee small hours of the morning---after playing a job somewhere else, then riding all night to the next venue. We checked into a hotel, bedraggled and groggy, and tried to get a little more sleep. much different life style. Our bus was just that---A BUS! No TV, or restroom, or beds! I could tell you many tales about that bus! One nighters were our most common types of jobs. We traveled all over the U.S., and did the Camel Caravan radio shows every Saturday night from a different University. Vaughn Monroe was not always with us on the bus. He owned his own private plane, ----and, he also was a pilot. On her subsequent career . . .
After leaving the band, I married Harrold Grogan--also a group singer who had sung as one the the "SonnySiders" with Sonny Dunham's big band. Together we sang in various vocal groups and recorded jingles and commercials. We were a part of the creation of singing radio jingles in the 1950's! Later, we recreated the Moonmaids, adding Harrold to the girls' voices, and naming him our "Plus One." Vaughn's wife, Marian, gave us the OK to use the Moonmaids name for our group. Thus, the Moonmaids Plus One, who sang for more than 10 years, standard songs of the big band era! We recorded two cassettes and one CD during that time. On working with Vaughn Monroe . . .
We were probably so young at the time, we didn't fully realize how very fortunate we Texas gals were! We just knew he [Vaughn] was a very fair "boss" and easy on us when we flubbed!!! We loved it when he called us "his Texas kids." On the two new girls . . . When Mary Jo left in Jan. of '50, Ruth Winston was hired to be our new lead singer. But that next 6 months was a grueling continuous time of one-niters, with a week stand in one or two of the places, so it was no wonder that June and I were ready to pack it up and head back home. However it was the hardest decision I ever had to make!!! We were the last group of Moon Maids! Vaughn gave up the touring band with a last date at West Point. Edie Gorme was the guest singer and I think it was a Camel Caravan Radio Show. Edie was just starting out in those days and had worked with us before in "borrowed gowns"! Whenever I saw her later in NYC she always called me the "Moon Maid". I am presently an instructor at College of the Desert in Palm Desert, CA. I teach Human Communication and Public Speaking there and I also teach ESL for the Palm Springs Adult School and work as their Publicity person, creating brochures, writing press releases and ads. I'll start teaching a graduate course in Career Counseling for Chapman University this fall as well. I'm very involved with the Community College Association in the state (the higher ed. division of California Teachers Association, largest in the country) and am on the board of directors. I'm also Chair of the Part Time Committee and lobby important community college bills in the capitol at Sacramento.